Shouldn’t Practice Mimic the Game? During my life, I have participated pretty heavily in sports. Play is fun and a great way to learn. I have dabbled in all kinds of sports. As I grew up, I played a lot of soccer. Not surprisingly, preparing to play soccer involved a great deal of playing the actual game. Sure, we drilled, but the drills were just micro-parts of the whole game. In late high school, I migrated to triathlon. While I certainly lifted weights and participated in stretching and plyometrics, most of my training involved actually doing long hours of swimming, biking, and running. Practicing was direct application and immersion in the sports. On “brick” days, I actually combined two, and sometimes all three, of the sub-sports with transitions so that practice immitated an actual triathlon. Practice was a virtual mimic of the game/event for which I was preparing. Is school, in its traditional format, a virtual mimic of the game/event for which we are preparing students? My school’s mission states that we are preparing students for college and for life. I have a pretty good idea of what college is like. I have been to several as an undergrad, a post-grad, and a graduate student. My experiences at those colleges was fairly similar to my experiences as a student in K-12 school. The formats, structures, and cultures were similar. By “life” I think we mean “work” to a considerable degree. For many of one’s waking hours of life are spent working. During the past 20 years, I have spent my career working in schools, but I have never really worked in the “business” world. As an undergrad, I trained as an economist and as a marketing-management scientist. But that’s not the same as really living the business-world life that most of our students will enter after college. How do we know that we are preparing students for the “life” part of our mission? Are you reading as much as I am that business leaders indicate that students are not so well-prepared for the work-life realities? Could it be that the the practice is not a close enough mimic of the game? Is this why UVa Med School is striving to make practice more like the actual game? In the past three days at Unboundary, I believe I have been given a rare gift as an educator. I have immersed myself in the “business world.” I will continue to do so for several weeks. While one, short sortee into the business world makes me no expert, I do have a new perspective than many career educators don’t really get to experience. 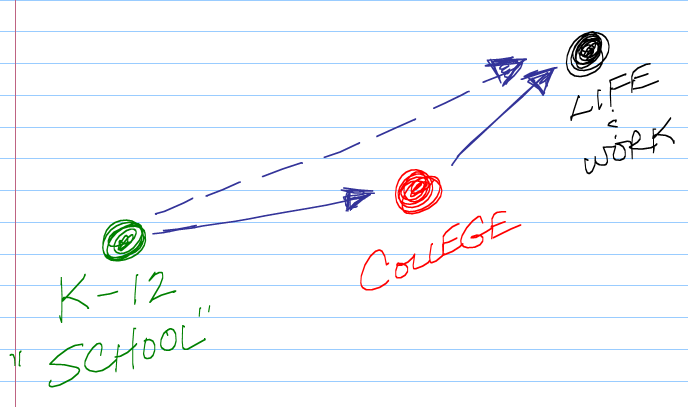 I feel like I have been able to discern another data point on the life-education graph, and doing so allows me potentially to draw a line of better fit from school to college to life. Moreover, in the past three days, I have seen in my mind’s eye the replaying of several influencial videos that I have written about and shared in previous blog posts. Sir Ken Robinson’s RSA video has come to mind countless times. The Buck Institute videos about project-based learning, and the ongoing conversation that Jonathan Martin and I are having, come to mind. Steve Johnson’s “Where Good Ideas Come From” – both the TED talk and the RSA video – come to mind. Kiran Bir Sethi’s Riverside School comes to mind. Edutopia’s videos on High Tech High and other immersive learning environments come to mind. Watching a team of three Unboundary pros working on a pitch, presentation and workshop design has been like watching the game or event that we are preparing Synergy 8 students to play in our practice sessions. It has been like looking in a mirror to study our form and muscle memory. It has been like preparing for life. Not “like”…it has been preparing for life. This entry was posted in 21st C Learning, Sabbatical 2011 and tagged 21stC, PBL, play, practice, reflection, sabbatical, Unboundary by boadams1. Bookmark the permalink. I like your filling out of the metaphor you have shared with us in the past–at times about football. This metaphor works for me in the discussion about what is the purpose of school. I think deep practice that mirrors what students will experience in the work world is important. Our students will mostly become professionals of one sort or another, so it would be somewhat straight forward to retool our curriculum (Synergy 8 style) to have their work in school more closely align with the deep practice necessary to truly master something, apply the knowledge, and make a difference. Some students already do this but generally with hobbies or interests not related to school. So I am on board with your thoughts on the matter. Here is where I see the problem and the land mines. Does this work in middle school but then gets lost in high school because the stakes are higher–AP, SAT, college, HS teachers that see their discipline as the central focus, GRADES, TESTS, and all the same old things that make school not relevant to the work world. I see HS teachers (over generalized) as fearful of making any real change in these areas. I see administrators as fearful of rocking the boat. These seem like barriers that unless overcome will get in the way of innovation. For me the question is what to do about these problems so that the conversation going on does not get consumed by these realities. The education world is unravelling a bit with the stuff going on in WI, OH, CA and beyond. NCLB has to be dealt with. These bigger issues impact how our society sees the teaching profession. I think we have our work cut out for us. There is lots to do to change the MINDSET. Your post is the beginning, the middle but not the end.